News and events out of the Haltom City Code Enforcement Division are listed here. Code Enforcement operates out of the Police Department. As of July 23, 2018, the Haltom City’s high grass ordinance was amended. The biggest change to the ordinance is the limiting of the amount of high grass on your property. Previously, the ordinance allowed for the average grass height of the property to be in violation before a notice of violation was issued. 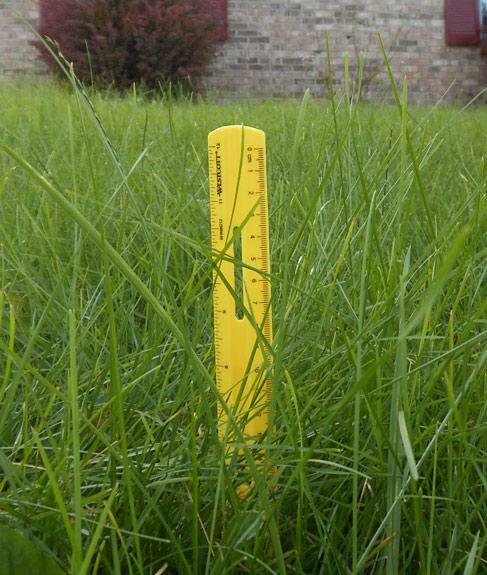 With the new ordinance, ANY amount of high grass and weeds in excess of 10 inches would be in violation. A prime example is when a property is mowed, but high grass is left around flower beds, utility poles, fire hydrants, etc. This includes vertical and horizontal grass, such has grass laying down or growing over the edge of the curb. Properties consisting of more than two acres will only be required to maintain the first 50 feet of each property line until the center portion of growth reaches the state fire code maximum of 36 inches in height. The amended ordinance is available for download above and viewing below. Why a High Grass Ordinance? Mosquito & tick populations thrive in high grass areas. The new dangers of mosquito-born diseases that cause illness and even death are more common now. Likewise with ticks carrying lime disease. Controlling their population in a compact, urban setting requires ordinances such as this. High grass depreciates property values, and general disregard for code standards can attract criminal elements to communities. High grass/weeds are not to exceed 10” in height and must be maintained to the back of the curb or where there is no curb maintain to the street. This includes areas behind fences and over sidewalks. Overhanging tree limbs and vegetation impeding pedestrian or vehicle traffic visibility should be trimmed to 13’6” above streets and 8 ft. above sidewalks. Limbs should be bundled & tied in 3 ft. lengths for waste disposal. Ten day warning notices will be issued prior to city enforcement but habitual offenses will receive Notices of Violation filed with municipal court. Parking on unapproved surface such as front lawn, over sidewalks or curbs is prohibited. Parking of recreational vehicles in the public street is prohibited beyond 24 hours for loading or unloading. Storage on the property should be in compliance with approved surface regulations and should not encroach a public right of way. Such vehicles may not be used for living quarters in any zoning district and thus should not be continuously connected to utilities. Such vehicles include boats, trailers & boat trailers, tent trailers, horse trailers, utility trailers, campers, personal watercraft, and motorized coaches or pick-up campers. Permits are required for most minor repairs and remodel work including replacement of windows, siding, trim or roofing. It is always advisable to contact the permit office at 817-222-7730 to ask if permits are required before starting any home project. Permits are also required for landscape irrigation systems. For more information contact the Haltom City Code Enforcement Division.